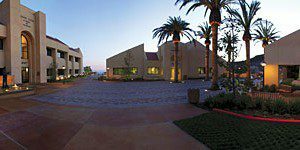 The Pepperdine University full-time MBA at Graziadio School of Business is a traditional two-year format, but can also be taken as an accelerated one-year MBA, or as an international MBA. On the accelerated track, 12-and-15-month options are available, depending on prior academic preparation. Full-time MBA students can apply to spend a trimester abroad in the fall term of their second year at one of Pepperdine’s partner universities in Africa, Asia, Europe, Latin America, or Oceania. Pepperdine’s IMBA gives student a unique opportunity to learn both in traditional classrooms and abroad. Students have the chance to learn across Europe, Asia, Africa, Australia, and Latin American countries. The two-year Pepperdine full-time MBA program is completed in five trimesters consisting of 61 units, including a business internship. Forty-five units are comprised of core courses, while the other 16 units are elective courses. Core courses for the full-time MBA include: Financial Accounting, Cost, Accounting, Economic Concepts, Applied Data Analysis, Managerial Economics, Information Resources and Technology, Finance, Marketing, Managing within the Legal, Ethical and Governmental Environment, Personal Development for Leadership, Theories and Models of Organization, Macroeconomic Analysis, Technology and Operations Management, Quantitative Business Analysis, and Strategic Management. Students are encouraged to choose a major area of concentration and complete 12 units of electives in their chosen area. Areas of concentration include: Digital Innovation and Information Systems, Dispute Resolution, Entrepreneurship, Finance, Leadership and Managing Organizational Change, and Marketing. The 12-month Pepperdine MBA degree is completed in three trimesters consisting of 49 units, 35 units of core courses, and 14 units of electives. The three specializations for the one year accelerated MBA are: Finance, Marketing, and SEER (Socially, Environmentally, and Ethically Responsible) led by former Patagonia CEO Michael Crooke. The 15-month degree takes four trimesters to complete and requires students to take 51 units. Students on this track can specialize in Digital Innovation Systems, Dispute Resolution, Entrepreneurship, Finance, Marketing, or SEER. In a typical Pepperdine full-time MBA class features 55 percent of students that identify as male, and 45 percent that identify as female. Students in the class have an average GPA of 3.2 and an average GMAT score of 648, with an average of 5 years of work experience. International students comprised 44 percent of the class. The average age of matriculating students is 29. The Career Portal allows students to search jobs, post resumes, register for career events, and more through this website exclusively for Pepperdine Graziadio students and alumni. Students can take advantage of one-on-one, short-term coaching sessions for guidance on resumes, interviews, career planning, as well as salary negotiation. Pepperdine offers career workshops, webinars, career fairs, industry panels, and networking events to help students and alumni further their careers. Tuition for the traditional, two-year Pepperdine full-time MBA, 15-month accelerated MBA, and international MBA each total $99,000. The 12-month option for the one-year full-time program has a total tuition cost of $74,250. Merit-based Scholarships: The Graziadio School offers a variety of scholarships based on academic achievements. The consideration for merit scholarships is determined by the applicant’s cumulative GPA, GMAT or GRE score, and professional work experience. Endowed scholarships: The Graziadio School offers several specialized endowed scholarships. Both the recipients and the amounts of these awards are determined according to the requirements of the specific endowment. There are three main types of financial aid: Federal Direct Stafford loans, the Federal Direct Graduate PLUS loan, and Alternative Educational Loans. Applicants to the Pepperdine full-time MBA program must have a four-year undergraduate degree, or equivalent. A minimum of one year full-time professional work experience is required for the full-time MBA. Both of the accelerated full-time MBAs require at least three years of work experience. To apply to the Pepperdine full-time MBA program, applicants must submit a completed application form, all college transcripts from degree-granting and non-degree-granting institutions, and a current résume. The school also requires applicants to complete one essay about their leadership experiences and goals; applicants may also submit an optional essay for any additional information they wish to convey to the Admissions Committee. Applicants must also send in their GMAT or GRE scores and a nonrefundable $150 application fee. Graduates who did not earn degrees in English must provide TOEFL, PTE, or IELTS scores. Recommendation letters are not required. Interviews are technically optional, but highly encouraged.